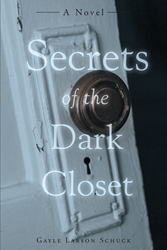 “Secrets of the Dark Closet” from Christian Faith Publishing author Gayle Larson Schuck is an engrossing work of historical fiction following the life and travails of Bessie Kloubec, a bright and sensitive young girl navigating the pain and humiliation of her dysfunctional family in her small Midwest community. “Secrets of the Dark Closet”: is an engaging story of a young girl’s courage and perseverance as her once happy family begins to unravel. The story opens in rural Iowa in 1899. “Secrets of the Dark Closet” is the creation of published author Gayle Larson Schuck, a former public relations professional who is a member of Dakota Writers and American Christian Writers who enjoys outdoor adventures with her family when not reading or writing. A young girl’s world is shattered, her family shamed and scattered in this coming-of-age story. Webster County, Iowa, 1899. Bessie Kloubec wants to be seen as more grown-up. After all, she’s turning eleven. However, she’s not prepared for the calamity that begins in the predawn hours of her birthday. Calamity that unravels her formerly happy family and indeed forces her into an adult role. For the next year, Bessie navigates through a series of family disasters caused by her father’s pain-induced alcoholism. Bewildered but brave, she struggles with her own fear and anger while trying to fix her broken family. But can she? In 1904, Bessie is almost sixteen when the family moves to LaMoure County, North Dakota. Their secrets left behind in Iowa, they are welcomed into the community. However, when a new family scandal breaks out, Bessie’s old fear and anger grips her again. Where can she find the healing needed so her heart can move forward? Based on a true story and told in first-person, Bessie’s dilemma is as relevant today as it was over one hundred years ago. Published by Christian Faith Publishing, Gayle Larson Schuck‘s new book is an engrossing story of courage and determination as applicable to modern readers as it would have been to its heroine a century ago. View a synopsis of “Secrets of the Dark Closet” on YouTube. Readers can purchase “Secrets of the Dark Closet” at traditional brick and mortar bookstores, or online at Amazon.com, Apple iTunes store, Kobo or Barnes and Noble. For additional information or inquiries about “Secrets of the Dark Closet”, contact the Christian Faith Publishing media department at 866-554-0919.